At this point in the season, greens really start to proliferate — at the market, and in the home garden, they're everywhere and growing faster than anyone can eat them — visit a friend with kale, chard, collards or bok choy planted in his/her plot, and you'll be hard-pressed to escape without a bag full of leafy something. In this, summer is truly a time of excess. Last weekend, I was at my mom's place and missed the market. But she keeps a bountiful garden and wouldn't let me leave empty-handed. We stashed the greens in the fridge and, when I started to leave without them, she chased me down the driveway with a full bag of crisp bok choy (in purple and white), and another stuffed with kale: Red Russian, Lacinato, and a curly purple variety, as well as radish greens and collards. This morning, I was thankful: These cute little greeny bird's nests made one hell of a healthy power breakfast and tasted absolutely lovely. ’Tis the season for too many greens. 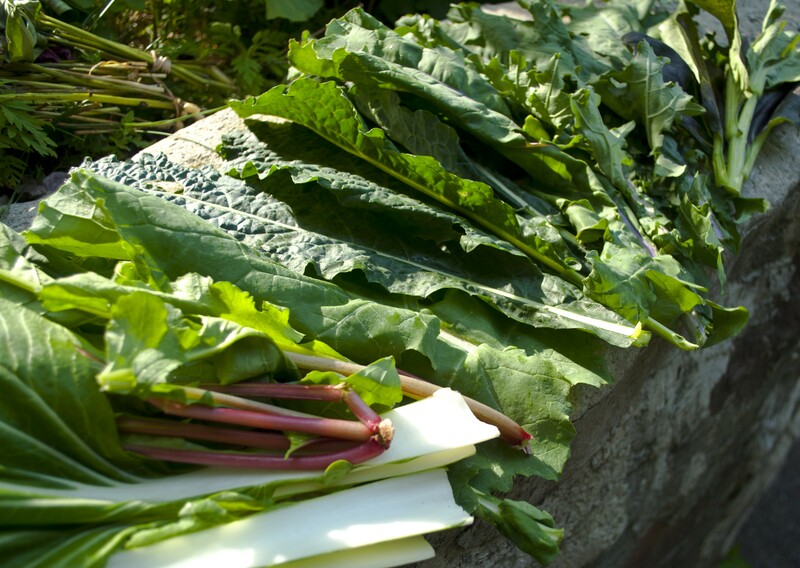 Wash and cut vegetables to size, separate stems from leafy parts of greens and dust leaves with salt and chili flakes. In a wide frying pan, melt butter over medium heat. Add garlic and sauté 2-3 minutes until garlic is fragrant, then add green stems and sauté another 3-5 minutes until stems start to soften. Add remaining greens and sauté, stirring constantly, another 2-3 minutes until they are thoroughly wilted but still firm and bright green. Form greens into nests. Make sure the nests are completely separate from one another (this will facilitate transferring the finished nest-eggs from pan to plate). Crack one egg into each nest, taking care not to break the yolk. Cover and let cook 3-4 minutes (maybe a wee bit more) until the whites — including the membrane covering the yolk — are set but yolk remains runny. For firmer yolks, cook another 2-5 minutes until they set to where you like them. 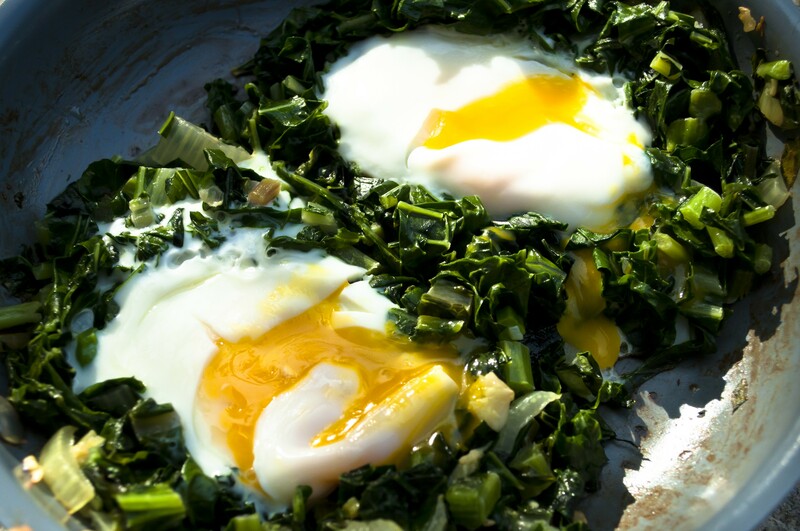 This recipe is really much, much better with runny yolks, as they moisten the veggies. Break the yolks and serve bird's nest over toasted sourdough bread, English muffin or rye ... Sour, whiter breads go better with this than wheaty, nutty breads.